Lately I’ve been reading about Panton—his retrospective book published by the Vitra Design Museum, as well as the aforementioned volume—and I am utterly blown away by how Panton throws himself into using color, and even develops his own color system (in partnership with Mira-X, throughout the 1970s). Since it is so awash in color, Panton’s color method has inspired me rethink my praxis of — or reliance upon, or addiction to—using white. Looked upon in one way, the selection of white over another color virtually represents a lost opportunity to inject a work with more depth and vibrancy. For quite some time, I have viewed white as a symbol of purity—a manifestation, or return to, something’s original state. (Perhaps this is a result of being overexposed to cleaning-product ads since birth?) It affords guaranteed negative space in a composition. Further, placed against fluorescent colors, it can make a fluoro red or orange “pop” completely. And it pairs perfectly with black. While this line of argument has streamed through my mind, I have been mesmerized by the color charts in Panton’s Mira-X color system. I’ve scanned them from the Vitra volume for you here. The first is Panton’s “version 2” Mira-X system (12 original colors, plus 36 new colors, black and white). Below that is an expanded “version 3” system, (36 additional colors; a total of 86). 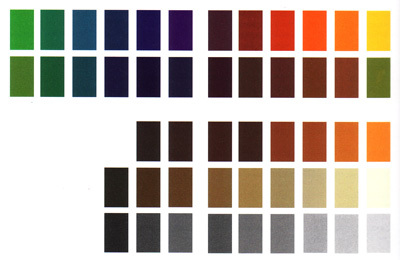 I’m truly half-tempted to try to create a color system of my own. Pre-mix all of my paints ahead of time, and rely on those. I suppose it would have a host of fluorescent hues! In other news: Below are two works on paper I produced over the weekend. These reflect a “Version 2” design of Civvik. The curves are slightly more angular than the original. Again, because they are works on paper, they are experiments. Whether or not I get them “right” is not a consideration. I am merely making. In closing, the inauguration of President Obama today culminates a remarkable change of spirit within our culture. The way I feel is this: If you don’t get it, you just don’t get it, period.